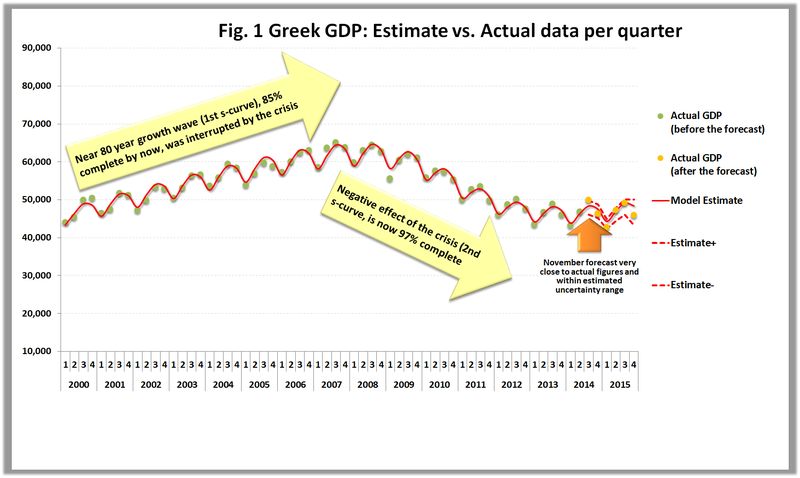 Greek GDP forecast: a lost decade? As the Second Economic Adjustment Program for Greece is soon coming to an end, there is a growing debate about the impact of the agreed austerity measures, whether the economic recession is finally over, and, most of all, what the next day may be. In order to evaluate the course and future potential of the Greek economy, in terms of GDP value and growth levels, we used a double s-curve model, with a seasonality effect, and publicly available data from the Hellenic Statistical Authority. Although obviously simplified, the aforementioned model sheds some light to the dynamics of the Greek economy, foreseeing a mild recovery at lower growth rates compared to those before the crisis. More specifically, according to the generated forecast (Fig.1), the near 80-year long term growth wave of the economy (the 1st positive s-curve) has been interrupted by the crisis (the 2nd negative s-curve), leaving the economy as it was more than ten years ago, in terms of GDP levels. In a sense, this was a “lost decade” for Greece that occurred in a much smaller amount of time. Overall, based on the available actual and forecasted data, it seems that the negative impact of the crisis fades out, leaving though a permanent “hit” to the economy as both growth rates and expected GDP levels per quarter are lower than before the crisis. Consequently, if Greece wants to reach prior to the crisis levels of development, it seems that merely following the current trend is not enough, as the country needs to “reinvent” itself and initiate another-positive this time-economic shock that will reinstate the previous level of growth. Having said that, this forecast follows the current trend of the Greek economy based mainly on the implementation of the Second Economic Adjustment Program. Depending on the Greek government's and its lenders' policies in the next few years, the trend may be altered and in this case a new forecast will be in order to reflect these changes. To download the detailed forecast, click here. This estimate of the Greek GDP has been concluded since the last period of a one-and-a-half-year long forecast has been reached. It performed very well against actual data, having a small average error of 2,5% - within the model's estimated uncertainty range - as the latest update for Q4 2015 from the Hellenic Statistical Authority reveals! And it did so despite the prolonged time of the projection (1,5 years) and the significant political and macroeconomic turbulence in Greece during the previous year (2015). As we mentioned in our original post, when the Greek economy reached a temporary phase of stabilization in 2014, with a potential for a mild recovery in following years, its future course depended mainly on the policies / agreements of the Greek government and its lenders. Unfortunately, instead of exploiting the opportunity to “reboot” the Greek economy and initiate growth, quite the opposite has happened following a series of political decisions that brought the economy to its knees. To be more precise, although all actual GDP values are within the expected margin of error, they tend to reach the lower uncertainty levels, thus indicating a possible trend change in 2016. As a matter of fact, if we recalculate the model taking into account all the new available data from Q3 2014 to Q4 2015, the new forecast gives lower estimates for 2016 by 2%. In my opinion, the Greek economy is in “red alert”, but not everything is lost. If the trend was irreversible we should have already seen some values outside the uncertainty range and we haven’t, at least not yet... Give it a little time with no or the wrong set of actions and a new negative trend will emerge once more. Greece has already lost 10 years of development through the crisis and cannot, should not suffer another hit. There is still hope for recovery but that can only come from the private sector through innovation, entrepreneurship, educated risks, and targeted investments. The public sector should facilitate and safeguard the process and nothing more. Greece needs more corporate flexibility and risk-taking and less government intervention, in order to boost creativity and competitiveness and reinitiate growth. Note: this is the last update, since the forecast reached the last estimated period, i.e. the last quarter of 2015. This forecast of the Greek GDP-after more than one year- still performs very well against actual data, having a small average error of 2%, as the latest update from the Hellenic Statistical Authority about the third quarter of 2015 reveals! As we anticipated though, there are signs of a possible trend change as Greece is once more officially in recession in 2015 following a few quarters of growth in 2014. More specifically during the first three quarters of 2015 the economy declined on an average by 0.2% against an estimated 1,4% growth for the same period and an average actual growth of 0,7% in 2014. This implies that the new political circumstances of the current year may have changed the economic and business environment for the worse. The new update by the Hellenic Statistical Authority about the second quarter of 2015 shows that the trend and forecast of Greek GDP still hold strong after one year! However, our fear for a possible trend change for the worse is still there, since the impact of the July referendum and the subsequent third memorandum between the Greek government and Europe remains to be seen in the following months. Last night’s announcement of the Greek Prime Minister to call a referendum on July 5th added to our fears that the trend is indeed changing for the worse, regardless of what the outcome will be. With the third and fourth quarter of 2014 and also the first quarter of 2015 now released, we can see that actual GDP figures are very close to the forecasted values and within the estimated uncertainty ranges! That’s a nine month “look” into the future, since the forecast was based on actual values up to the second quarter of 2014. More specifically, during the last semester of 2014, the economy grew by 1,6% vs. the predicted 0,6%, thus overshooting by 1%. During the first quarter of 2015, we observe quite the opposite, i.e. the economy grew by a mere 0,1% vs. the predicted 1,2%, thus losing the gained 1% growth and “correcting” its course closer to the initial projection. If this was only attributed to a natural correction to the original overshoot, then we should expect the economy to come back quickly to the predicted 1-2% growth by the end of 2015, which would be great! However, in my opinion, this is not the only reason for what we observe. The prolonged duration of the negotiations between the newly elected Greek Government and European officials creates new circumstances that may alter the very nature of the prediction, most likely, for the worse. Right now, it seems like the economy lacks direction and is draining all the available growth reserves and momentum gained in 2014 as everyone is waiting for a final agreement. Waiting too long or making a bad-or no-deal will have a huge impact on the economy. I guess we’ll have to wait a little bit longer to see if and to what extent this will change the economic outlook of the Greek economy for 2015 and, possibly, for the following years.